Túnel del Dos Valires. Fase III. Enllaç Toulouse. 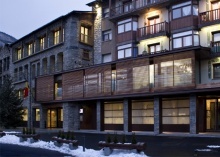 This project begins with the willingness to reform and connect the Procedures building with the Commune House of Ordino, located in the main square of Ordino, and create a single entity.